I am silent for a time. Yet another to battle? What can it be? In the distance I see the eerie silhouette of a huge crocodile in the dark waters beyond the next gate. This must be the large monster He warned me of earlier. It seems so huge! I am afraid and yet numb at the same time. I do not want to go any further, I do not want to do this. Even in the distance this thing looks so big I do not think that I can tackle it, especially not so quickly after the first three. We rest briefly, but I do not feel rested or ready when He says it is time. “Come, I will carry you.” He takes me, as before and swims to the final gate. It opens quietly and surprisingly easily. We pass though without challenge. The water here is calm and eerily quiet. I keep looking for the creature here, but see nothing but still calm water. Only the small ripples made by His powerful strokes are visible. At last I must ask, “What is the monster here?” My voice is barely above a whisper. “Fear of abandonment.” He replies, also in hushed tones. The monster is now upon us! It throws itself at us, lunging straight for my heart! The pain is intense as its teeth tear at me. I scream like that baby, but with no sound. 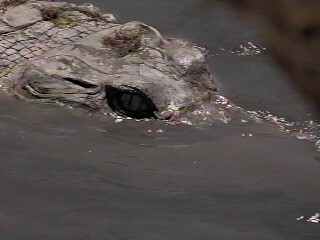 The crocodile disappears for a moment underneath the cloudy waters, only to resurface in another brutal assault. This time though, it manages to lock its teeth onto my arm and it rolls us into the water. I am suffocating, drowning! Finally, for a moment, we surface and I gasp for air. “Papa!” I cry, no other words available to me. “Use your sword.” He reminds me. He is calm, but there is an urgency in His voice. Spurred by that urgency, I clutch at my sword with my free arm. This time, it seems much easier to use it. “He said ‘I will never leave you or forsake you’ “ I stab at the creature with the glinting blade. “ I am with you always, even to the ends of the earth.” I cry over and over, driving the keen blade in over and over again. At last the reptile releases me from its grip and after a few moments, I see the carcass floating belly up in the water, carried away from us by the current. Fear, relief and exhaustion flood over me and I am crying as He carries me to the shore. Lifting me from the waters, He sets me on the bank, “Rest now.” He sits with me until dawn begins to break over the garden. In the faintly pink light of the infant morning, He carries me back to the familiar grove where the tree and the waterfall reside. Gently, He sets me on my feet again. I am covered with the effects of the battle, dirt and debris from the dirty waters and gore from the carcasses of the monsters covers me. “Wash the gore away.” He instructs leading me to the waterfall. I obey, anxious to be clean once again. It takes a long time to free myself from the remnants of the battle.. When the filth is finally gone, I realize just how much everything seems to hurt. I feel like my guts have been ripped out. I am exhausted. “Papa, please, anoint me! Heal me!” I weep knowing I cannot continue on this way. He does not need to say anything. He covers me in His balm. I almost do not notice my nakedness before Him. A small part of my mind wonders why this was ever such an issue to me. “Come, sit with Me.” He puts His arm around me as we walk to the base of the tree. Together we sit, leaning against the massive tree trunk and I sleep upon His shoulder.